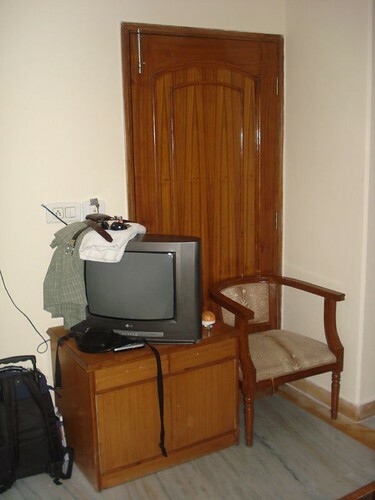 We arrived in Delhi too late to catch a connecting flight that night so we purchased our ticket for early the next morning and headed to find a hotel and a way to get on the Internet. I found an Internet cafe but there was no way to connect my laptop to their system so I was only able to send a quick email update to a few folks that we were safe in Delhi. We didn't sleep well that night for various reasons and we had to get up at 4:00AM to get to the airport on time. I had come down with a stomach bug which made traveling all the more uncomfortable. We boarded our 3+ hour flight to the southern city of Kochi, about 1200 miles south of Delhi in the beautiful state of Kerala. There we were picked up by Bro. Roy, the assistant to the India director, Bro. Abraham. Then it was a 3+ hour ride through the lovely countryside to finally arrive in Thiruvalla, the base of our Indian operations. The southern state of Kerala is beautiful. It is called “God's Country” by the Indians themselves and you can easily see why. It has a very diverse landscape, hills and flat areas. 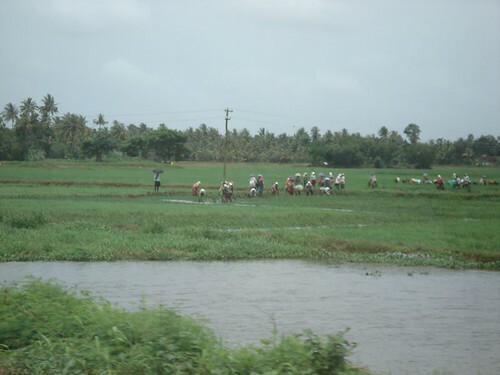 The area we drove through was very low with many canals and rice paddies. Many people live in these lowlands, some right on the water. They all have small canoes to take them back and forth and some have fashioned crude hand-powered ferries to transport themselves across the canals. We were exhausted and were glad to get checked into our hotel. After getting settling in and saying goodbye to the brothers we both crashed for a much-deserved nap. Even though this is one of the more primitive hotels we've stayed in, it has the best Internet connection – a cable modem! After my nap I headed down to the hotel to log into the Internet to update my blog and upload some pictures. I was also able to watch the Christian Challenge service live over the Internet, and what a blessing that was! It was great to get to see familiar faces and to get to worship virtually with my church family. I had recorded a brief video greeting in Pakistan and another arriving here in Thiruvalla which I had sent and I think they enjoyed it as well. Then it was back to my room for a wonderful night's sleep. The following morning we were awakened by singing from a Pentecostal church next door. This was a big change from the last time Patrick was here when he was awakened by the Muslim prayer calls. What a nice change! I headed downstairs to the lobby but this morning I was unable to connect my laptop to the hotel's network. After an hour of no success I began using their computer, which is fine for checking emails, but doesn't allow me to upload pictures, videos, etc. I also got to IM with my lovely wife for a bit, which was a plus. I headed back to the room to check on Patrick. I had begun feeling much better but now he was stricken by the same bug I had experienced the day before. Bro. Abraham had arrived and prayed for Patrick while I was downstairs and soon he felt well enough to head down to the conference, which would take place in a meeting room in the same hotel. 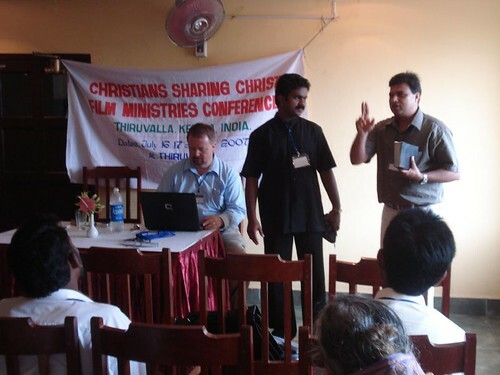 We had invited the 18 film teams from around India to join us for three days of testimonies, training and encouragement. Sixteen of the film teams were able to make it to the conference, some traveling as far as 5 days on a train to get here! Praise the Lord! The brothers had been praying for us in the meeting room and when we arrived they were excited to receive us. We had a wonderful time of worship and prayer together and then Patrick and I brought greetings to the CSC team. 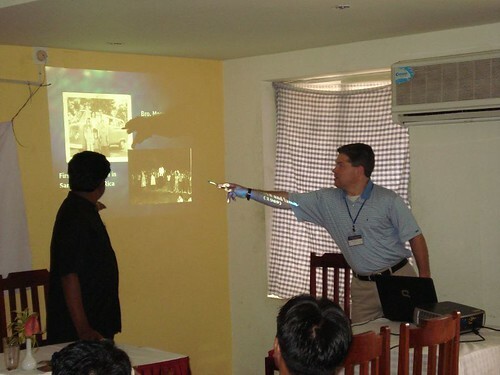 Patrick then shared the history of how CSC came to India, the letter he had received from Bro. Abraham, the email from another brother and the magazine cover speaking of the need for film evangelism in India, all in the same week. 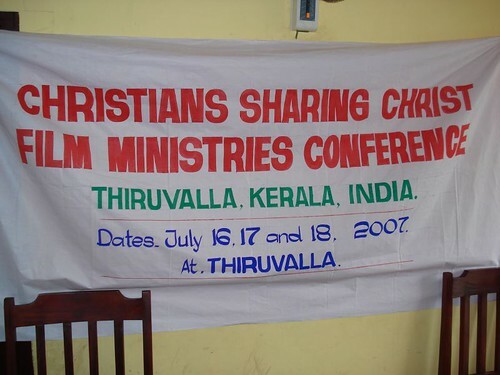 This was an encouragement to the brothers to see how the hand of the Lord had led CSC to India. This was the first time for many of them to meet Patrick, who they had heard of from Bro. Abraham, the CSC Asia director. Then Patrick had each of the brothers stand an introduce themselves briefly before calling on some of them to begin giving reports. Roy Matthew was the first brother to give his report, as he was the first team started under Bro. Abraham's leadership. (He came to the states a couple of months ago and some of you may have met him.) He shared part of his testimony, that he was not worthy of this ministry but was chosen and used by God, not according to his own worth. 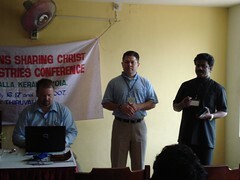 He is very grateful that the Lord has brought CSC to India. Roy shared that after coming to the Lord he preached for many years, evangelizing in many villages with some success but no big responses. But now with the films, large crowds gather, hundreds who otherwise would not come to hear an itinerant preacher, but who come to see the films. And many are being saved, not because of them, but because the Lord has given us this tool to reach so many more than before. He is very thankful for the tool of film evangelism. He gave a passionate call to the other brothers that there is no time to waste, that we must RUN to the harvest fields for the Lord is coming back soon! Several more brothers were able to give their testimonies of how God has used Christians Sharing Christ Film Ministry to empower them to reach so many more than their previous efforts. One shared of a witch doctor who accepted Jesus after watching one of the films. This resulted in many of the villagers also accepting Jesus. Another brother works in the Andoman Islands in the Bay of Bengal, 572 islands located about 1200 kilometers from the Indian mainland. Only 40 of the islands are inhabited, 20 of which have been reached by the Gospel of Jesus. 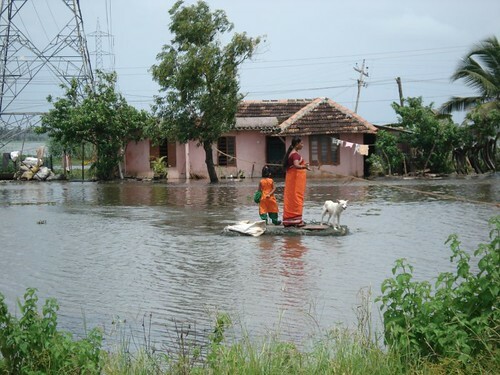 These islands are in constant danger by tsunamis such as happened just a couple of years ago. The brother feels a great pressure to take advantage of the time before another disaster happens. There are 20 islands yet to be reached, some are inhabited by 5 different primitive tribes who don't have any idea of who Jesus is. The people are so receptive to the giant screen, fascinated by the moving pictures of giant people! Tremendous growth is taking place in the churches where the films are shown. He gave the example of going to one island and traveling 3 hours inland by foot to a group of primitive peoples, many of whom accepted the Lord and invited them back to start a church. These brothers' faith and willingness to endure hardship are inspiring. They travel long distances, time away from family, dangers in some areas, hardships in others. All for the sake of carrying the Gospel of Jesus Christ to where His name is not known. These men are my heroes. While they gave Patrick and me the seats of honor, they are the ones who should be honored, in my opinion. We broke for lunch and then came back together for the afternoon session. Patrick walked the brothers through the CSC PowerPoint presentation that we share with the churches in the states, to give the brothers a better understanding of the overall ministry. This has been helpful in each of the countries, to help them understand the heart of CSC, what we're about, what we do and what we don't do. Then we resumed the testimonies. This is one of our favorite parts of these meetings, hearing what God is doing through these champions of faith. One brother shared that he had seen the power of film evangelism especially among the illiterate people. He had a burden to reach the masses around him. He tried many things that were not effective. But through film ministry he has seen literally thousands of people come to faith in Jesus. He testified to their change of life, the happiness and joy they would receive. At times they would show films until 3:00AM because the people wanted to see more and more about Jesus. Other villages the people would not be as responsive so they used shorter films and prayed for the sick, seeing miracles, causing people to believe in Jesus. When miracles happen, people talk about it! One man who had been hurt in an accident and couldn't walk for 5 years. During one of the services the Lord healed him and he stood up and began to walk by himself. Many people knew this man and his condition and are now seeking the know the Jesus who healed him! As a result he was invited to a hospital to visit a woman who was told she was terminally ill. The Lord raised her up from her death bed and she was discharged from the hospital the same day. This caused many doctors and nurses to inquire about Jesus! All of this because of film ministry! A few other brothers shared their testimonies until it was time to break for the evening. We fellowshipped with the brothers for awhile and then said goodbye the evening. Patrick and I took a stroll around the area around the hotel but because it was raining we didn't stay out long. After a light supper we headed for bed early, still trying to catch up from the fatigue of the past few days. It is so encouraging to hear the testimonies of the film teams, to hear of their faithfulness and their excitement of having a tool to reach so many. Previously they were fishing with fishing poles, now they are fishing with nets! Tomorrow will be another day of sharing with more testimonies. We will also share a photo slide show of our trip so far, updates from the Philippines, Nepal and Pakistan. In the afternoon Patrick will work through the manual with the teams. All of their training has been oral so this will be a great tool for them to reference in the future. This leg of the trip is different from the other three legs. In the Philippines, Nepal and Pakistan we were establishing new teams. Here we are hearing reports from teams already in existence. What a great encouragement to hear these reports – and to know that soon we'll be receiving such reports from the other three countries where the Lord has led us. Yes, the trip has been hard and it's been difficult to be away from our families. But to know that many more souls will be added to the Kingdom of God through these new film teams makes any difficulty worthwhile. Thanks for reading! Awesome Nathan. Be safe and have a great last leg of your trip. Life Church is lifting you guys up. Roy M.'s testimony of the little boy from the village gave me chills. It is amazing how God is always working "ahead" for us now. Praise Him! God bless you and your journey for HIM!